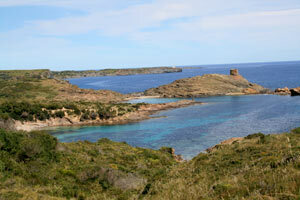 The walk is not difficult although the pathways beyond the beach on the Cami de Cavalls can be uneven and rocky in places. It should be possible to take a rugged pushchair along the first part of the walk [Blue, red and orange on the map. Starting in the car park head back along the road [Blue route 250 Mtrs] to the entrance in to S'Albufera. The main path to the end of Es Grau beach is very easy and pushchair friendly [Red route 900 Mtrs] and is mostly under shade from the trees. You can take detours around the lakes again most paths are pushchair friendly and have walkways over marshy ground. 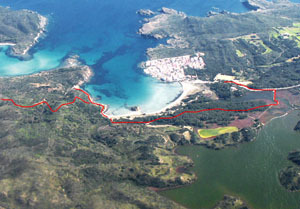 Return is along the beach [500 Mtrs] or you can extend the walk along the Cami de Cavalls as far as you wish, but the pathway here is very rugged with steep climbs and rocky going. In total the walk through the woodland and back along the beach is approximately 1.0 miles/1.6 km's and should take you around 0.5 hours with the occasional stop for photography and a drink. 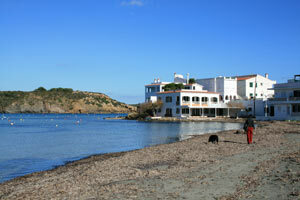 Good walking shoes if extending the walk onto the Cami de Cavalls, sun hat, sun cream, a large bottle of water, picnic and towels for a stay and swim on the beach. Download the route in Google Earth Route file .kmz Main route and the Extended route. Es Grau from the air. 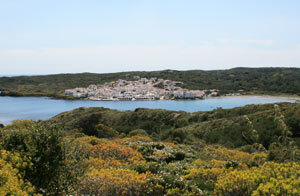 The views can be great from the Cami de Cavalls. Looking back at Es Grau.